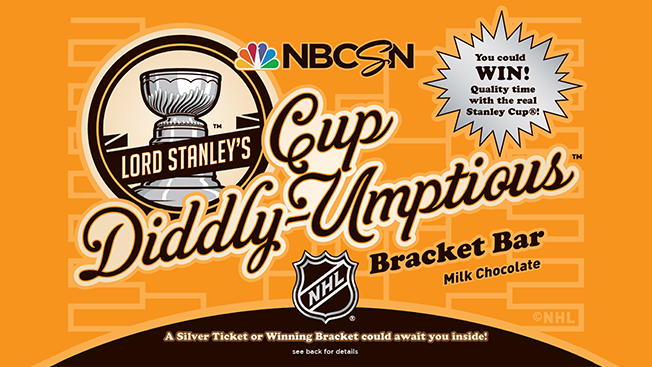 NBC Sports and the NHL are using chocolate bars and a potential Willy Wonka-like payout to trumpet the Stanley Cup playoffs. Part of the "Every Game. Every Night. 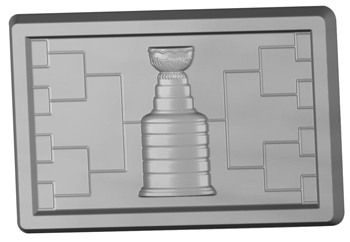 Don't Miss a Moment" campaign, the promotion features 32,768 "Lord Stanley's Cup Diddly-Umptious Bracket Bar" chocolates—one for each possible bracket outcome of the 16-team tournament. The goal is to tout the 105 playoff games available on NBC, NBCSN, NHL Network, USA Network, CNBC and streaming on NBC Sports Live Extra. "We're playing off the bracket success of college basketball's March Madness," said John Miller, CMO of NBC Sports Group. "It's a stunt designed to cut through the clutter, to be DVR-proof and noisy." Each of the bars, from Long Island City, N.Y.-based Chocomize, has an imprint of a blank bracket with the Stanley Cup in the middle and comes in a unique wrapper with one of the thousands of possible bracket combinations. Whoever has the perfect bracket, after the NHL champion is crowned, wins a trip to the 2016 NHL All-Star Weekend in Nashville, Tenn., and some time with the Stanley Cup. "It's a perfect combination—music, ribs and hockey," Miller said. Four fans will get bars with a silver ticket, netting them a trip to see Game 3 of this year's Stanley Cup Final and time with Lord Stanley's hardware. And those with one of the 2,048 bars correctly identifying the eventual Stanley Cup champion get a $25 gift certificate to the NHL Store in New York. "We're also encouraging the radio stations to talk about and give away their bars," said Miller.